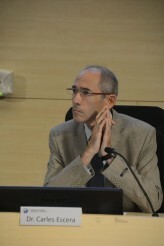 We speak with Carles Escera, professor at the Faculty of Psychology and head of the research group BrainLab, after some days he left his position at the Institute of Neurosciences of the UB. Escera talks about his years at the Institute and tells us about his plans for the future. I have been the director of the Institute for eight years. Although that work did not involve many complications, it required dedication because there were many issues to be worked on. Also, I directed the then Institute for Brain, Cognition and Behaviour Research (IR3C), which evolved and added neurosciences. At that moment, we had three times the amount of researchers, six times the number of research lines, and four the number of campuses we were represented in: the complexity and the diversity of the Institute of Neurosciences grew a lot. I think we were lucky to witness such a historical process in the psychology at the UB and in Spain, because it happened in other places many years ago: the institutional recognition of scientific psychology. Although this concept existed already, there was a dichotomous and confronted view between the two epistemological views of psychology: the positive one and the phenomenological one. The creation of IR3C was the determining step towards the acceptance of psychology as a positivist science without distinctions among the academic community and society in general. After that, we started growing and we began functioning as a research institute; actually, before becoming the Institute of Neurosciences and doing research on psychology, we were the third or fourth biggest institute of the University of Barcelona regarding resource-raising and publications. Why did it turn into Institute of Neurosciences? Going from IR3C to Institute of Neurosciences was the consummation of the second globally accepted reality here, and that is, psychology being part of neurosciences; brain sciences. We are what we are because we have a nervous system, a brain, interacting with our surroundings and which makes us an organism, an entity, but which never stops depending on the former, Therefore, neuroscience is the way to understand these complex phenomena: it ranges from the analysis of behaviour to the observation of the ion exchange between neurons through its membrane. Accepting psychology as a positivist science first and then as a discipline in neurosciences results from a natural evolution that occurred in other universities as well. What was the conversion process into Institute of Neurosciences like? The management was more complex after becoming Institute of Neurosciences. Before that, with IR3C, its management covered an area mostly about psychology, and it was limited to a physical area too, Mundet Campus, and I knew everyone. The Institute of Neurosciences covers a wider area in which there are issues I do not know deeply about, it is distributed around four campuses and I do not know every researcher; this is harder to manage. The growth of the institute was carried out together with the Vice-rector’s Office of Research; we identified everyone working on neurosciences and we invited them directly to take part in this. We conducted an open call to everyone who was interested in joining the Institute of Neurosciences, and we had a positive response. We were about a hundred researchers in the former IR3C, and after that call we received around two hundred applications. Those plans that have nothing to do with management… On the one hand, I would like to spend a sabbatical year abroad to do research. But I cannot do that, so I would like to have a functional sabbatical, I mean, to disconnect from commitments. I want to focus on research and start new projects. We started working on the creation of a new research institute. As the director of the Institute of Neurosciences I was in all the creation phases of this institute and it is now functioning. This is the Research Institute of Sant Joan de Déu, and it was created at the request of Fundació de Recerca Sant Joan de Déu with the collaboration of Hospital Sant Joan de Déu and Parc Sanitari Sant Joan de Déu, the Institute of Biomedicine (IBUB) and the Institute of Neurosciences of the University of Barcelona, and the Research Centre for Biomedical Engineering of Universitat Politècnica de Catalunya (CREB). These four entities have created this institute, which is at the frontier between paedriatrics and human development over the cycle of life. It gathers five main areas of research, although there are more fields: metabolic diseases or adult diseases originated during childhood, infectious diseases, cancer, neurological diseases and rare diseases. The idea is to launch projects at the Hospital Sant Joan de Déu within the framework of the research institute, in which I want to develop my research line. In fact, we launched a project to work on a marker of brain activity in babies regarding the processing of language sounds which could be applied to those cases that can indicate a delay in neurodevelopment. But the aim is to go further and offer a universal cognitive screening, so that it can be applied to all births, since it is a quick and bloodless test. Also, we do not want to determine the characteristics of this physiological response but to make it relatable, through a study of brain mapping with maturation of auditory life.